Presence of water on Mars has been always a topic of discussion for the researchers. Even though it is still not confirmed, whether the Red planet ever possessed water. Since 2011, peculiar strips (possibly water) have been noticed to appear and then disappear from the planet’s surface. Lujendra Ojha, the then scholar at the University of Arizona, first discovered these mysterious strips. These strips were named as recurring slope lineae (RSL) based on their characteristics as shape, yearly recurrence and occurrence on slopes of the crater walls. And researchers like Ojha are carefully observing this yearly event in the hope of finding traces of minerals that are left behind after the RSL disappear. These mineral would help researchers to unfold the characteristics (water related or not) of RSL. 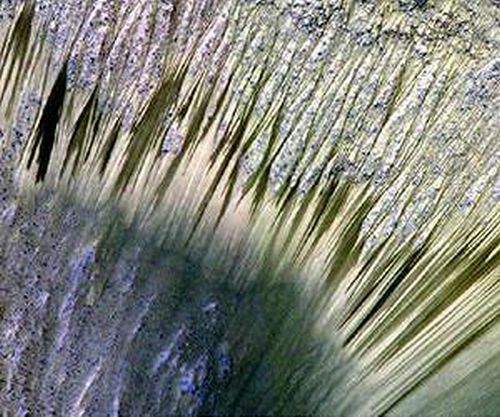 Using technologies like Compact Reconnaissance Imaging Spectrometer for Mars (CRISM), Georgia Tech Assistant Professor James Wray and Ojha examined 13 sites of RSL and found no traces of spectral signature linked to water or salts. However, at most of the sites they found definite and regular spectral signatures of ferric and ferrous minerals. At RSL sites, the size of the minerals was present in abundance as compared to non-RSL sites. These evidences still do not completely support the existence of water on RSL. However, it is not fully understood how the process could happen in absence of water. And as RSL appearance are more marked and distinct in some particular season, similarly the spectral signature presence were observed to be more marked and distinct in warmer season than in colder months of the planet, said Ojha. The researchers also reported that the absence of water related absorption abolishes hydrated salts as a spectrally main stage on RSL sites. As Ojha explains, that ferric sulphates, which are strong antifreeze, are found in abundance on other places on the Mars surface. And the presence of such salts in RSL indicates that upon exposure to the planet conditions, they were already dehydrated substantially, by the time CRISM observed them in the mid-afternoon. Ojha, Wray, and other Arizona-based teammates predicted the ideal sites for the appearance of RSL around the southern mid latitudes areas of rocky cliffs.